The only way to get Leafs tickets….and maybe a bike rack? The first auction lot closes at 8:30 pm. The second auction lot closes at 9:30 pm. Final auction lot closes at 10:30 pm. Everyone is welcome to join us for the Remembrance Day service. Save the Date – Winter Concert – December 4th at 6:30 pm. Is there anything cuter than those kindergarten students? The participants will be as follows: All Kindergarten Classes, Grade 6, Grade 7, Room 9, Room 1, Strings, Band, Glee & Earl Haig Singers. Click here for the October School Council Meeting Minutes. Pitch in for the planet and for our schools! 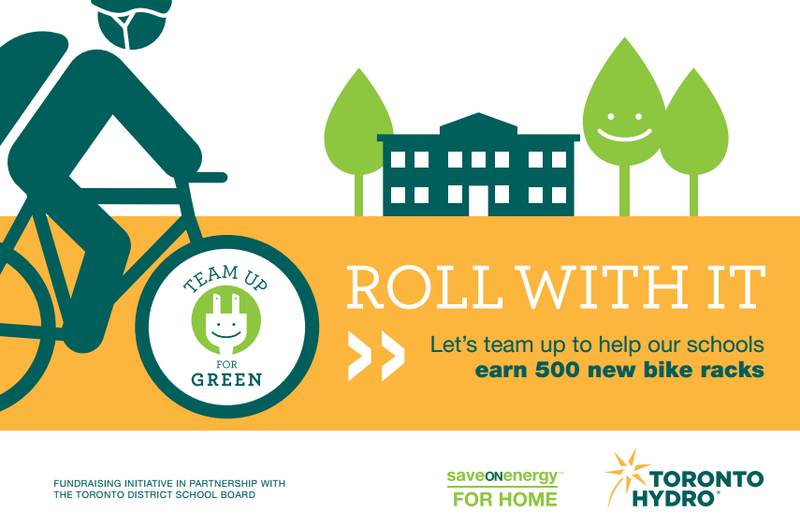 Our school is participating in Team Up For Green, a brand new fundraising initiative that encourages TDSB families to sign up for Toronto Hydro’s conservation programs and paperless services. If sign up goals are met, the TDSB will receive $250,000 towards the purchase and installation of 500 new bike racks at our schools! Team Up For Green is an environmental initiative of Toronto Hydro in partnership with the Toronto District School Board. Working together we can benefit our students, the environment and schools. To sign up, please visit TeamUpForGreen.com. Previous Previous post: Deck the Halls with Poison Ivy! ‘Tis the season to be slimy!